The space agency says that Curiosity Rover lead scientist John Grotzninger was perhaps a tad overexcited when he claimed that a recent discovery on the red planet will be "one for the history books." John Grotzninger caused a bit of a stir last week with comments about a recent analysis of the Martian soil conducted by the Curiosity rover. NASA hasn't yet announced the results of the analysis, but Grotzninger implied that whatever the rover had found, it was big. "This data is gonna be one for the history books," he told NPR. "It's looking really good." That led very naturally to all sorts of speculation about what might be happening on, or under, the surface of Mars. The presence of alien life, perhaps? Evidence of life at some point in the past? A buried Shadow ship? Alas, Grotzninger refused to spill the beans. But now NASA is moving to downplay the cryptic tease and dial back the excitement. "It won't be earthshaking but it will be interesting. As for history books, the whole mission is for the history books," spokesman Guy Webster told Time. "John was excited about the quality and range of information coming in from SAM [Curiosity's Sample Analysis at Mars] during the day a reporter happened to be sitting in John's office last week. He has been similarly excited by results at other points during the mission so far." 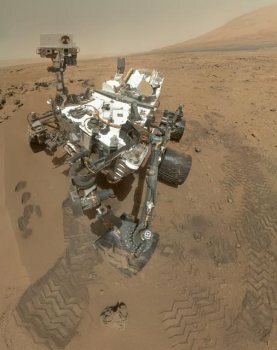 The agency's concern may be stoked by an earlier Curiosity analysis of the Martian atmosphere that appeared to contain methane, which could suggest the presence of life, but that was later found to be a false positive. NASA has also been burned by similar over-excitement in the past: In 1996 it had to step back from an announcement of the presence of organic compounds in a Martian meteorite that suggested the possibility of life on the planet at one point in its history. NASA will unveil Curiosity's findings, whatever they may be, on December 3.